Rising oil prices fueled robust returns for oil investors in 2016. Here's what made this quintet the best oil stocks of the year. Bakken shale-focused driller Continental Resources was one of 2016's biggest surprise performers in the oil patch. That is partially due to an atrocious 2015, when the stock plunged more than 40%. However, Continental made back its losses from 2015, and then some, because of its impressive performance in 2016. After initially anticipating a double-digit production decline in 2016, the company now expects production to come in roughly flat thanks to stronger-than-anticipated well performance and higher oil prices. It also generated excess cash flow and sold non-core assets to pay down debt. The result is that Continental Resources is in a much stronger position at the end of 2016 than it was to start the year, which lifted a huge weight that had been holding down the stock. Devon Energy is also coming off a rough performance in 2015 when its stock plummeted 47.5%. One of the drivers of that decline was the company's decision toward the end of the year to spend $2.6 billion to strengthen its core positions in the STACK play of Oklahoma and the Powder River Basin. The market worried that this hefty price tag was a bit much considering the crashing crude market, which could put unneeded pressure on the company's balance sheet. Devon, however, worked hard to alleviate those fears by selling more than $3.2 billion in non-core assets in 2016. Furthermore, the company turned its STACK asset into a growth engine, which has it positioned to deliver double-digit oil growth in 2017 as long as crude remains above $55 per barrel. That ability to restart its growth engine at much lower oil prices is one of the drivers behind Devon's strong showing in 2016. 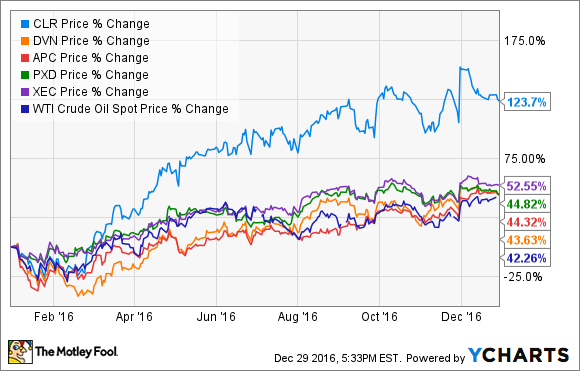 Anadarko Petroleum also spent much of the past year repositioning its portfolio to grow at lower oil prices. The company announced several asset sales in 2016, totaling more than $5 billion in monetizations, which strengthened its balance sheet. In addition, it took advantage of an opportunity to acquire premier assets in the Gulf of Mexico at a bargain price. Because of these efforts, Anadarko Petroleum is now in the position to deliver 12% to 14% annual production growth in a $50 to $60 oil price environment while living within cash flows. That optimistic growth outlook had investors flocking to its stock in 2016. Image source: Pioneer Natural Resources, Sands Weems. Unlike most other oil companies, Pioneer Natural Resources did not skip a beat in 2016. From the get-go, the company expected to deliver double-digit production growth thanks to its prime position in the Permian Basin. However, due to impressive well results, it outperformed its own expectations pushing its oil growth rate from an estimated 10% at the start of the year to a projected 14% year-over-year increase. Also, Pioneer Natural Resources believes that it can deliver 15% annual production growth along with 25% compound annual cash flow growth through 2020 while living within cash flow by 2018 in a $55 oil price environment. Given the company's past success and rock-solid balance sheet, investors are optimistic that Pioneer can outperform those lofty expectations. All things considered, Cimerex Energy had a rather quiet 2016, only spending enough capital to keep its production roughly flat. Instead, what drove its stock price higher is the fact that it controls positions in two of the country's hottest shale plays: Permian Basin of Texas and the STACK/SCOOP plays of Oklahoma. These rising stars caught the industry's attention over the past year due to their low drilling costs and high hydrocarbon content, which combine to generate stellar well results at lower commodity prices. Because of those exceptional returns, Cimerex Energy only needs to spend $600 million in capital during 2017 to deliver 11% year-over-year production growth. What's remarkable about that number is that it is the same spending level the company had in 2016, which was down 29% from 2015 and 47% from 2014. Investors see this capital efficiency as a game changer for Cimerex because it could grow even faster in the years ahead as it fine-tunes its techniques in these emerging oil growth plays. While rising oil prices lifted most oil stocks in 2016, the best performers had one thing in common: These companies have either repositioned their portfolio or driven down their cost basis so they can thrive at lower oil prices. Because of this, these producers should deliver robust growth in 2017 and beyond, given the outlook that oil prices should be even higher than they were in 2016.